Spray 5- to 6-quart slow cooker with cooking spray. In slow cooker, mix all ingredients except Buffalo wing sauce and cheese. Stir in Buffalo wing sauce into chili. Sprinkle individual servings with blue cheese. If you don't have Buffalo wing sauce, substitute a mixture of 1/2 teaspoon red pepper sauce and 1/4 teaspoon ground red pepper (cayenne). 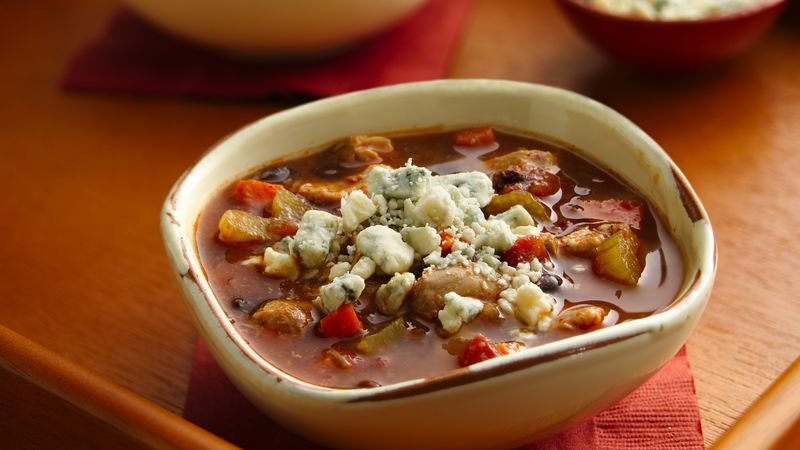 If you choose not to serve this soup sprinkled with blue cheese, complete this meal with a tossed green salad topped with blue cheese dressing!